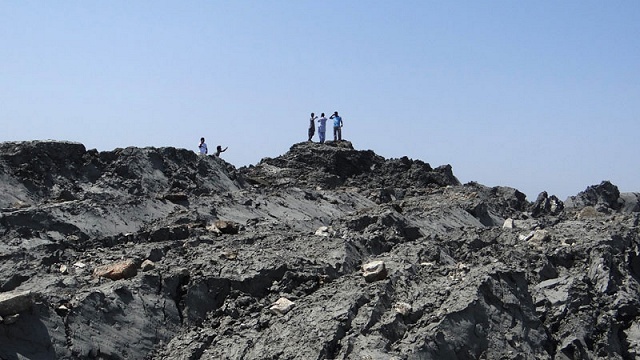 Pakistan's New Earthquake Island: Can It Happen Here? When Pakistan was struck by a major earthquake earlier this week, one of its side effects seemed to capture the attention of the news services: several hundred miles from the shock, a small island rose above the waves of the Arabian Sea. Could America see the same thing when we get our next big earthquake? Very possibly. Details are sparse, but at least two new islands appeared off southern Pakistan in the hours after the distant shaking stopped. The one shown in the photo was about 100 yards long, about half as wide and about 50 feet high. It was peppered with bubbling mudpots emitting enough methane gas to be an explosive hazard. The signs are those of mud volcanism, a kind of cold eruption powered by high-pressure underground fluids. In this case the fluid would be natural gas (methane) and probably some brine along with it. The distant earthquake presumably caused this by disturbing a delicately balanced situation in which the fluids were very close to eruption already. Perhaps the gas had been seeping out in a stable way, and the extra shaking pushed it too far. Perhaps a near-shore landslide set things off. The best guess is that deeply buried beds of methane hydrate "ice" released a large amount of gas after the shaking. Only an expensive, rapid scientific expedition can allow us to learn the real scenario, and that won't happenthe sea will wipe the island off the map in a few months. But we can look at the general tectonic setting at the large scale, courtesy of the U.S. Geological Survey's earthquake viewer. Heavy red lines are plate boundaries. 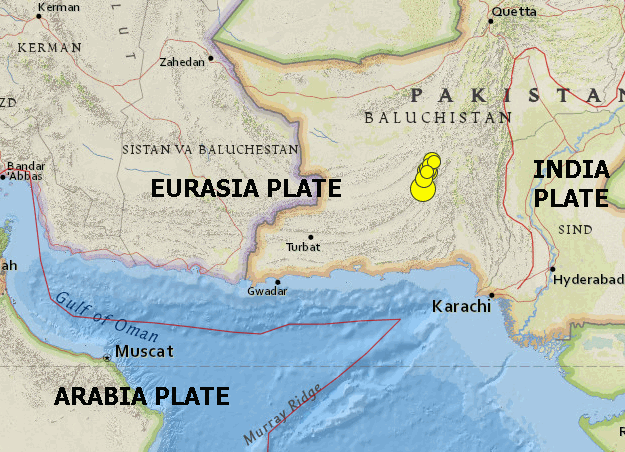 Tuesday's earthquake and its aftershocks appear as dots in the mountains of Baluchistan. The new island appeared at Gwadar. Tectonically, this area, known as the Makran, is being squeezed and crumpled as Arabia pushes northward into Eurasia. The natural gas in the young rocks of the Makran and the offshore sediments are free to move in this settingit is as if the Yucatan were pushing the Gulf of Mexico shut against New Orleans, allowing the buried oil and gas (and methane hydrates) of the Gulf to escape. There's no place exactly like that in the United States, where two continents are colliding. However, southern Alaska and the Santa Barbara coast are similar. Let's look at California. 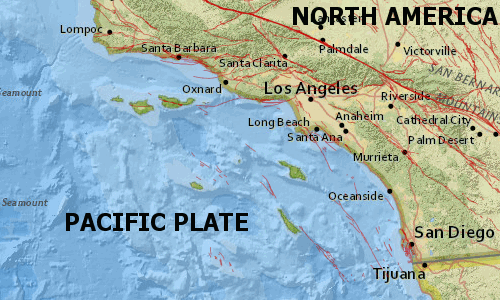 The Pacific plate is moving north-northwest against a bend in the San Andreas fault (the heavy red line marking the plate boundary), which is why the Transverse Ranges are rising there. The ocean basins off the Southern California coast are full of oil and gas, and the large islands of the California Continental Borderland are approaching the mainland there. The last magnitude-7 earthquake to happen off Santa Barbara was in 1812. Records are very scant, of course, and short-lived islands may well have appeared at the time. We'll know for sure when the next big one hits. 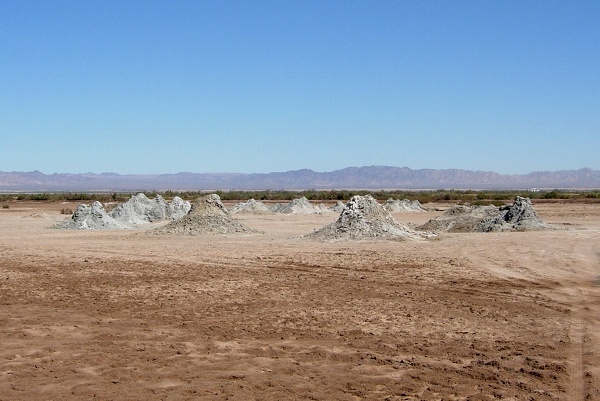 California has many mud volcanoes in the Salton Sea area, where I took this photo. These are basically hydrothermal in origin, like the mudpots of Mount Lassen or Yellowstone. Parts of the Salton Sea basin are actually seafloor spreading centers, just like those in the deep seas, that the Colorado River has buried kilometers deep in mud. Historical reports from the 1850s until the 1907 flooding of the Salton basin describe spectacular eruptions that threw steam a thousand feet in the air. You don't have to be in remotest Pakistan to live in an exotic and occasionally terrifying place.